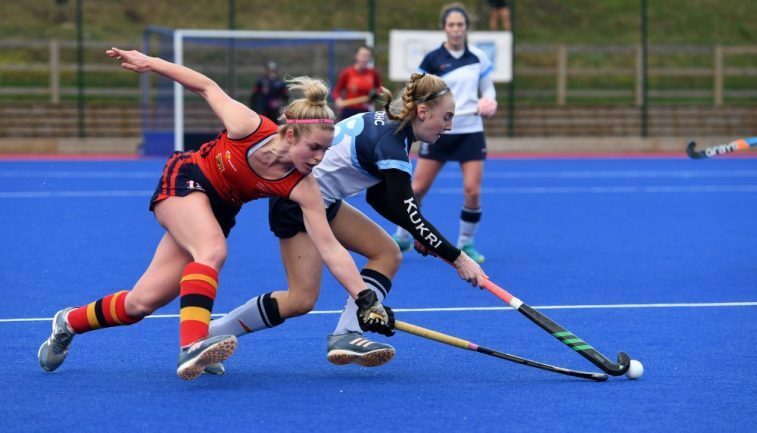 Holcombe opened up a three point gap at the top of the Investec Women’s Hockey League Premier Division, their 2-1 win over rivals East Grinstead being enough to leapfrog former leaders Surbiton who lost at Buckingham. The first half ended 0-0 but the game sparked to life early in the second period, Sophie Bray finding the net for East Grinstead in the 40th minute from open play. 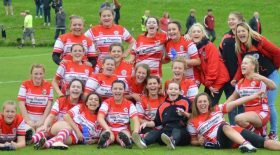 Holcombe levelled in the 62nd minute when Leah Wilkinson scored from a penalty corner before they sealed victory in the same fashion in the 67th with another goal for Wilkinson. Buckingham produced a good performance at home, winning 2-1 against Surbiton to inflict only their third league defeat of the season. Jenna Woolven gave Surbiton the lead early in the second half when she slotted in from open play in the 37th minute. Buckingham hit back five minutes later when Natasha James found the net from free play before Phoebe Richards sealed the victory for the home side with a goal on 58 minutes. Beeston ran out 2-1 winners at home against Bowdon Hightown. Rebekah Walker gave the home side the lead in just the second minute before doubling their advantage with her second of the game in the 29th. Rosie Bailey hit back for Bowdon with a goal from open play in the 39th minute but it was only to be a consolation as the home side held out to seal all three points. Elsewhere, the University of Birmingham and Clifton Robinsons played out a 2-2 draw. Flora Peel and Claire Thomas both scored a brace as the teams had to settle for a point each. Slough versus Canterbury also ended in a draw with the score being 1-1 at full time. Kitty Baccanello gave Slough the lead in the 13th minute before Agustina Alvarez netted for Canterbury in the 25th to claim a share of the spoils. Stourport maintain their position at the top of the Investec Conference West with a 3-0 victory at Swansea City. Cerys Preston gave the away side the lead in the 26th minute when she found the net from free play. Shortly after half time Lorna Mackenzie double the lead with a goal from a penalty stroke before Sophie Thompson sealed the victory with a goal from open play in the 61st. Gloucester City cemented their position at second in the table with a 3-1 win at home against Isca. Goals from Frankie Mayes, Charlotte McShane and Isabel Viant were enough to seal all the three points for the home side. Elsewhere, Olton & West Warwicks ran out 2-1 victors at home to Trojans, Exe and Barnes played out a 1-1 draw, and Reading won 1-0 at home to Oxford Hawks. Loughborough Students maintained their six point advantage at the top of the Investec Conference North with a 1-0 victory at the University of Durham. The only goal of the game came in the fifth minute when Hannah Cozens found the net from free play. Leicester opened up a gap between second and third place with a 2-0 victory at home to Ben Rhydding. Goals from Olive Hepi in the 11th and 40th minutes were enough to seal all three points. Elsewhere, Belper ran out 3-1 winner at Leeds, Sutton Coldfield won 2-1 at Timperley and Brooklands-Poynton versus Fylde ended 2-2. Wimbledon remain top of the Investec Conference East on goal difference after a 1-1 draw with third-placed Hampstead & Westminster. Kate Maxey gave Wimbledon the lead with a goal from a penalty corner after 30 minutes before Lauren Turner equalised in the 54th minute to secure a point for Hampstead. Cambridge City move up to second in the table after winning 3-0 at home to Harleston Magpies. Lisa Williamson gave the home side the lead in the 20th minute with a goal from a penalty corner before Rebecca Daniel doubled the lead in the 22nd with a goal from open play. Williamson scored a second in the 43rd to seal all three points and close the gap at the top. Elsewhere, Southgate won 2-1 at home to Ipswich, St Albans won 1-0 at home to Horsham and it ended 1-1 between Sevenoaks and Bedford. * Full results and league tables from the Investec Women’s Hockey League on 9 February 2019 are available to download here. Investec Women’s Premier Division: Beeston 2, Bowdon 1; Buckingham 2, Surbiton 1; East Grinstead 1, Holcombe 2; Slough 1, Canterbury 1; University of Birmingham 2, Clifton Robinson 2. Investec Conference West: Exe 1, Barnes 1; Gloucester City 3, Isca 1, Olton & West Warwicks 2, Trojans 1; Reading 1, Oxford Hawks 0; Swansea City 0, Stourport 3. Investec Conference North: Brooklands-Poynton 2, Fylde 2; Leeds 1, Belper 3; Leicester 2, Ben Rhydding 0; Timperley 1, Sutton Coldfield 2; University of Durham 0; Loughborough Students 1. Investec Conference East: Cambridge City 3, Harleston Magpies 0; Sevenoaks 1, Bedford 1; Southgate 2, Ipswich 1; St Albans 1, Horsham 0; Wimbledon 1, Hampstead & Westminster 1.